Mass coastal waters are characterized by numerous islands, inlets, estuaries, harbors and bays with direct links to many anthropogenic stressors. 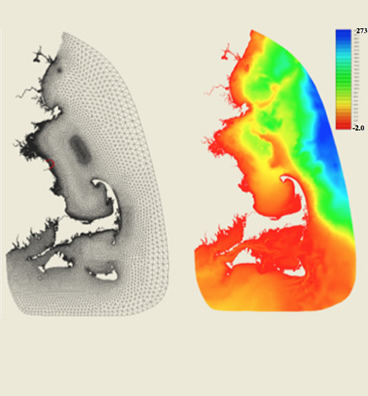 A state-of-the-art hydrodynamics model for this region requires (1) grid flexibility to resolve complex coastline and bathymetry, (2) mass conservation to accurately simulate water, heat, and nutrient transports, (3) proper parameterization of vertical mixing to simulate tidal and wind mixing, (4) modular design to allow easy selection of the essential model components needed in different applications, and (5) ability to use a wide variety of input data, especially as real-time atmospheric and coastal ocean measurements become more available. The MASS Coastal FVCOM meets all these basic requirements. The model domain covers Massachusetts and Cape Cod Bays, Boston Harbor, Nantucket Sound, Martha’s Vineyard and Buzzard Bay, with a horizontal resolution varying from 10 m in estuaries, Boston Harbor, and Cape Canal to 2-5 km over the outer shelf. The triangular mesh provides an accurate resolution of irregular complex geometry around the coast and even in harbors (e.g. Boston). Also, the mesh can be easily modified when better bathymetry data become available and if model results suggest that the dominant physical processes in some region are not being resolved with the existing mesh. MASS Coastal FVCOM is a subdomain model of NECOFS. It is driven by the same atmospheric forcing, river runoff, surface heat flux and precipitation minus evaporation as NECOFS and nested with the regional Gulf of Maine/Georges Bank/New England Shelf FVCOM (hereafter referred to as GOM-FVCOM). MASS Coastal FVCOM is tested and validated via field measurements and has been implemented into NECOFS. The MASS Coastal FVCOM and GOM-FVCOM run simultaneously using a “one-way interaction” nesting approach.